March madness is almost here! Are you ready? For February in the NBA our 1 unit plays are 0-3 and our 1/2 unit plays are 6-1. For the NBA Season, we are positive a whopping .65 units. Its been an uneventful season for the NBA. We were plus about 6 units for awhile but have come back to the even mark. Not much to say here. Its been pretty uneventful. The NBA is one of the toughest sports to handicap. A small number of teams with models virtually useless. Public numbers have some predictive ability but contrary to other sports reverse line moves tend to work against you on NBA sides. 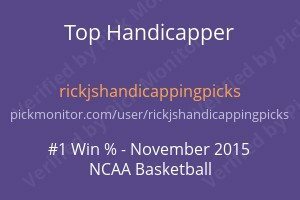 Best to fade the big moves or at least incorporate that into your handicapping. For the season we are off around 8 units. This is a bit off the norm as the NHL has been a small gainer most seasons. But as in the NBA what was once positive EV has changed a bit. Changes have not been that dramatic. I attribute the downswing, although minor, to variance more than anything else. The small number of plays are going to produce these types of results from time to time. I will take that every season. In the Westgate NFL SuperContest, I started out as fast as I have ever. Hitting an almost 70% clip through the first 6 weeks! But, then things changed and I ended up 2 games shy of 50%. Oh well, next season maybe. Again, I will take that every season. Not my best by far but a solid season. So we are back to football being the mainstay of my handicapping:) Some things never change it seems. The NFL has always been my best sport to handicap. From the very start of this site and as far back as I can remember the NFL has been for me the easiest to handicap. The reason is pretty simple. The public is the primary participant in betting the NFL. The “sharps” have not inundated this sport to the degree they have in other sports. You can see that by the line moves in college hoops contrary to the betting. Almost every side that is bet by the public the line moves in the opposite direction. Rarely now do you see a line moving with the action. If your not paying attention take a look at the lines today for college hoops. Check to see if there are any that move with the action. My guess is when you add up the tally at the end of the day it will be at least 10 to 1 with the lines moving contrary to the action. That makes college hoops much more difficult to handicap. Not only are the “sharps” distorting the numbers but if your a “sharp” bettor that puts your wagers in toward game time you’re getting a line that has most likely moved past the point of being a positive EV. Ideally on reverse line moves you want to have a game that the public is pounding and the line has move .5 in the opposite direction. Or perhaps 1 pt. Any more than that and you’re in no man’s land! Which leads us to College Hoops. We are getting crushed in college hoops this season. What could go wrong went wrong, with no exceptions? Our 1 unit totals that were the nuts in previous seasons took a big hit losing almost 10 units. Then my brainstorm of the 1/2 unit new plays contributed another almost 10 units to the downside. In my defense, these 1/2 unit new plays are still solid. I have been tracking them since I pulled them and they are extremely predictive. The problem is there are quite a few and I need to figure out a better method of filtering. Once I do I will again share these with subscribers. Then, of course, we are not done. What typically is a +25 unit start of the season put us in the hole? And, then conference play whittles away at that until tournament time. That has not changed one bit as conference play is as difficult as it has always been. Now, We have had at least 3 knockout seasons prior to this in college hoops. Matter of fact since I started handicapping college hoops up until this season it has been by far the best producer. 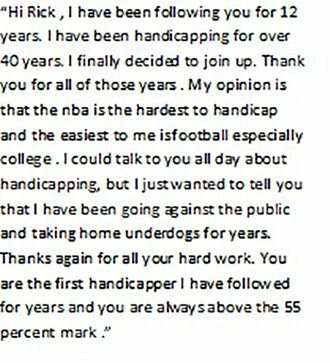 Typically in handicapping things do not change that dramatically. It’s usually a slow shift. But it is what it is. And that is why bet sizing is imperative as it is in all forms of gambling. Poker, the stock market, or sports betting. If you do not have a solid grip on bet sizing you will not last in any of these endeavors. I will spend the offseason going over college hoops more times than you can imagine. I am not concerned as typically I adjust pretty well. But I am optimistic about the upcoming MLB season. Not related to the typical plays which as you know are as big a grind as you can get in sports betting. But, as to the Overnight plays, I started posting about 6 weeks into the season. I started putting out the overnight plays about 6 weeks into the season. They were all 1/2 unit plays. We went 128-131 for +4.435 units and 11-5-1 +2.82 units gaining over 7 units on 1/2 unit plays. Remember, this is on 1/2 unit wagers. For 1 unit wager, we would be almost 15 units to the upside. Add in the first 6 weeks and subtract the last month and I anticipate a 30 unit upside for MLB season on these overnights. Sound overly optimistic? Perhaps…but consider that the overnights predicted the line moves with incredible accuracy. The above numbers are why I am optimistic about MLB overnights. In addition, we are not subject to having to take the worst of lines influenced by the “sharps” We are getting in before the “sharps” get into the game. So for this season, the overnights in MLB will be 1 unit plays. There will be volatility because the number of plays is substantial. But, you will more often than not have the best of the closing line substantially.